We are very excited to welcome today’s guest authors, Andrew Donkin and Eoin Colfer. 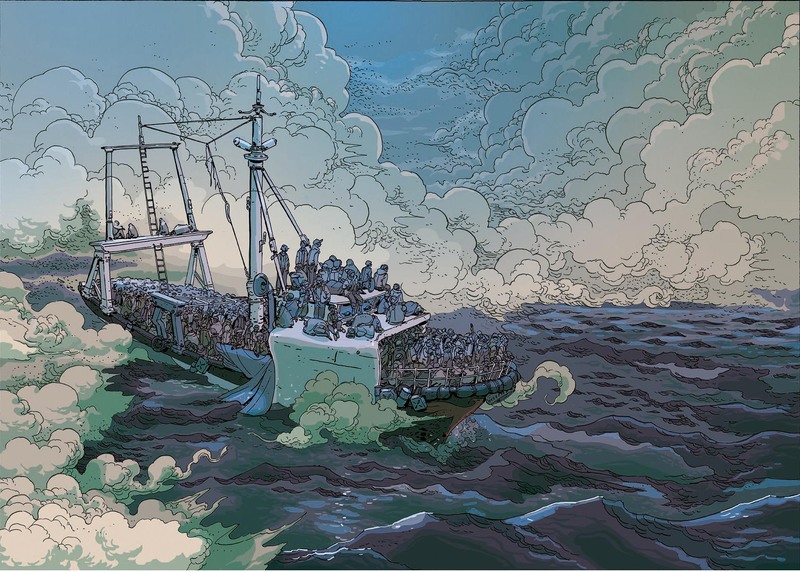 Along with artist Giovanni Rigano, they created the highly regarded graphic novel ILLEGAL about two young migrant brothers who are trying to find a better life. 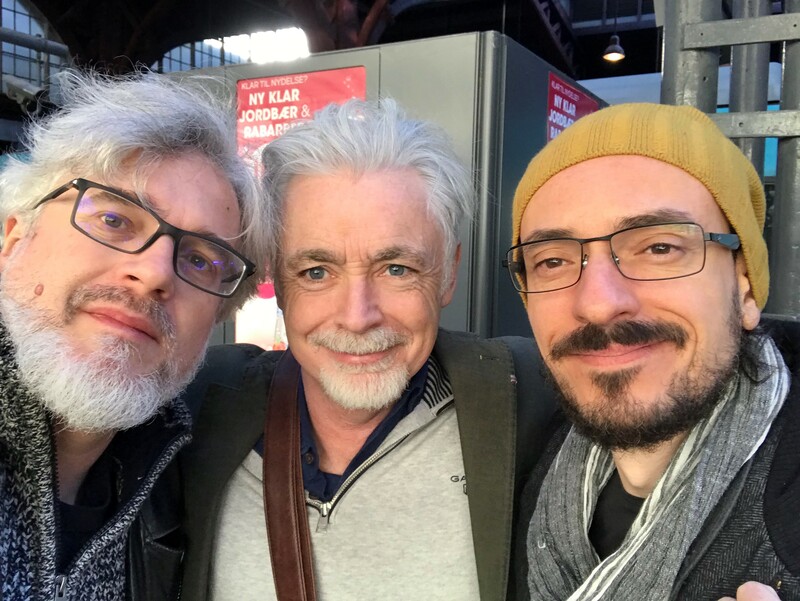 When our new graphic novel, ILLEGAL, was published last year Eoin, myself and our artist, Giovanni, were lucky enough to be sent on tour across America and Mexico to meet some of our readers face to face. It was a fantastic tour during which we gave many talks, signed many books, and had the chance to converse with many readers. We had been slightly worried that perhaps ILLEGAL might prove to be a European story, centered as it is on one family’s dangerous and dynamic struggle to come to Europe. What we found though as we toured from city to city was that people told us we’d written a fanatically American story without even realizing it. The notions of movement of people and families crossing boarders were things that hit home worldwide, and nowhere more so than in modern America. 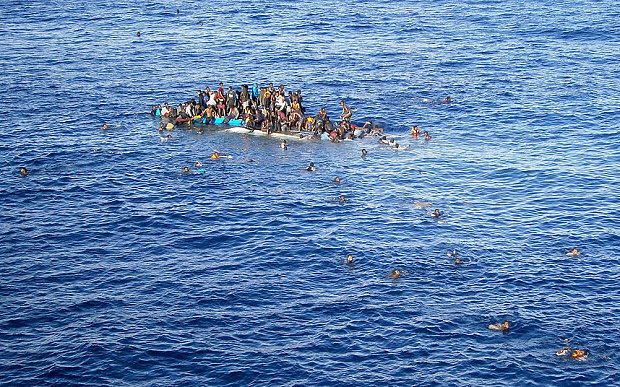 A boat with refugees sinks close to a cargo ship in the Mediterranean sea. ILLEGAL started life four years ago as a newspaper report the size of a large stamp. It was an uncredited report on page 28 of one of the weekend broadsheets about the sinking of a boat carrying would-be migrants across the Mediterranean Sea. The report explained it was “likely” that 69 people had drowned trying to reach Europe when their wreck of a boat had simply sunk into the cold, dark waters. Eoin and I discussed the report and waited for the follow-up stories with more explanation and a list of names of those lost. There was no follow-up. We began looking into the background. This was before the political upheavals of the last four years. Eoin and I were shocked by what we found. It seemed extraordinary that thousands of people were dying on Europe’s doorstep and there was hardly a mention in mainstream media at the time. When a sinking was mentioned, it was just in terms of numbers. No individuals. No personalities. No names. Eoin and I and Giovanni decided that we wanted to take one of those numbers and tell their story. What we wanted to do was to ask our readers to see each of those numbers as a human being with a favorite colour and a favorite football team just like them. With ILLEGAL, we wanted to reach an audience that wouldn’t pick up a broadsheet newspaper. We hoped a graphic novel, where a much greater part of the story is shown and not told, would be the ideal medium. Showing what was happening to our characters in Giovanni’s fantastic artwork instead of us describing their journey seemed a great way of presenting a story where we were very keen for the reader to make up their minds and to draw their own conclusions. ILLEGAL tells the story of two brothers, Ebo and Kwame. Ebo wakes up one day to discover that his older brother Kwame has left their village and knows he is trying to get to Europe to find their sister. 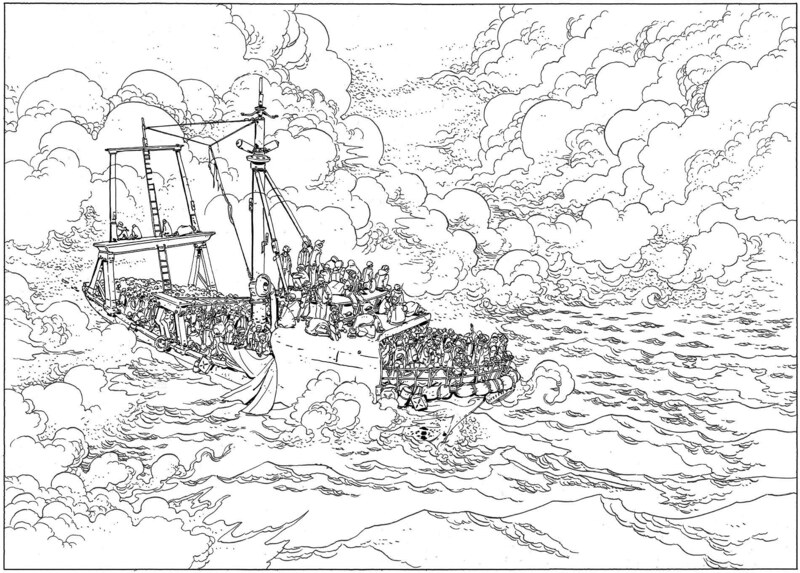 Ebo sets out on an extraordinary journey to find his brother, voyage to Europe, and reunite his family. We were very clear from the outset that we wanted Ebo and his brother to be, strictly speaking, economic migrants. We felt making them refugees fleeing a war-torn country might weigh the emotional odds too much in their favour. We wanted readers to put themselves in Ebo’s place as he searches for his brother against the odds, travels across the scorching Sahara Desert, and then finds himself adrift in a tiny “balloon boat” on the merciless sea. Eoin and I have been friends for getting on nearly twenty years. Whenever we’d meet in the early days, we’d be the only two people in the room that loved comics in the way people do who have read them all their lives. If Eoin and myself are the Iron Man and Captain America of the team (and in terms of rugged good looks, we think we are) then Giovanni is our Mighty Thor that completes the Avengers Prime trio with his amazing artwork. It’s fair to say that Eoin and I did more research for the writing of ILLEGAL than for any other book. We read everything that we could find, attended conferences, and conducted interviews with people who had made the journey as well as aid workers. We were determined to get every detail as accurate as we possibly could. We worked closely with two fantastic London-based charities: Women for Refugee Women and Migrant Voice. Hearing the stories of the people that they help was incredibly humbling and also a great motivator for the three of us. Our scripts for the graphic novels look a lot like film scripts. We describe the panel layouts on each page and the action happening in each frame. Gio then reads the script several times and produces a set of storyboards – rough versions of each page. This is often the most exciting part of the whole process for me, seeing Gio bring to life visuals that I’ve only seen in my head before. When the storyboards are approved, Giovanni draws a finished version of the page. ILLEGAL is 130 pages long, but Gio has drawn every page three times – storyboards, finished inks, and then colours. It’s hard work and took Giovanni over fifteen months of solid drawing to complete. ILLEGAL has been a labour of love for us for over four years. What we tried hard to do was to pick out one face in a sea of hundreds and tell that person’s story. In doing so, maybe we might remind people that every single person onboard those sinking boats is a human being. Readers of ILLEGAL can judge for themselves if we’ve succeeded. Illegal by Eoin Colfer, Andrew Donkin, & Giovanni Rigano. 9781492662143. 2018. Gr 7-12. The W.A.R.P. series by Eoin Colfer. 2013-2015. Gr 6-9. The Artemis Fowl Graphic Novel series by Eoin Colfer, Andrew Donkin, & Giovanni Rigano. 2007-2014. Gr 5-7. The Supernaturalist by Eoin Colfer, Andrew Donkin, & Giovanni Rigano. 9780786848799. 2012. Gr 6-9. The Artemis Fowl series by Eoin Colfer. 9780786808014. 2001-2012. Airman by Eoin Colfer. 9781423107507. 2008. Gr 7-10. The Supernaturalist by Eoin Colfer. 9780786851485. 2004. Gr 6-9. Eoin Colfer spent 4 years between 1992 and 1996 working in Saudi Arabia, Tunisia and Italy. His first book, Benny and Omar, was based on his experiences in Tunisia. In 2001 the first book in the bestselling Artemis Fowl series was published. Eoin lives in Ireland with his family. 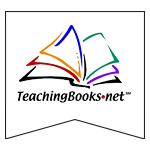 Learn more at eoincolfer.com. Andrew Donkin is a graphic novelist and has also written for adults. He lives in London. Giovanni Rigano has illustrated many graphic novels. He lives in Como, Italy.